The service entrance leads to a supposedly car-free 78th Street with an in-the-works pedestrian plaza and park. Photo by Clarence Eckerson. The city’s apparent capitulation to a well-connected car dealer prompted outrage from a coalition of activists, including Jackson Heights Green Alliance, Make Queens Safer, and Transportation Alternatives. “We ask that you close this service entrance, abandon your efforts to politically influence city agencies to derail the park expansion, and instead use your existing car service entrances,” the groups wrote to the car dealership and city agencies on March 7. The saga began in 2008 when local safe-street activists fought to permanently close the entirety of 78th Street between 34th Avenue and Northern Boulevard to cars after widely successful trials for several summers. Locals just wanted one small block in the residential community, which is deprived of green space, where families and kids could feel safe free from cars. A few years later, city officials permanently closed the majority of 78th Street to traffic — except for roughly 180 feet of the block to the edge of the notoriously dangerous Northern Boulevard so that parents and school buses could still drop off kids at the private Garden School, which has a garage on 78th Street. But bigwigs with the car dealership recently met privately with the Department of Transportation and Parks Department in an effort to keep access to the street for its 78th Street service entrance, which just opened this past fall. And now, the city is allegedly backtracking on its plan as the last piece of construction is already underway to give Koeppel Mazda what it wants, according to Will Sweeney, co-founder of the Jackson Heights Green Alliance, and local Council Member Daniel Dromm. Koeppel Mazda’s cars routinely zip in and out of the service entrance and use the dead-end to turn around. They are putting youngsters — like 11-year-old Miguel Torres, who was killed by a hit-and-run driver just a few blocks away in 2013 — at risk by using the street as an active thoroughfare, said Cristina Furlong, of Make Queens Safer. “It doesn’t make any sense to have this addition of new traffic on a dangerous corridor blocks from where Miguel Torres was killed in 2013,” she said. Koeppel, who owns a slew of car dealerships along Northern Boulevard, has a long history with Giuliani as his long-time friend and even former roommate. Koeppel has also given thousands in donations to the former mayor and other pols over the years, including Dromm, and Crowley, until he was defeated by Rep. Alexandria Ocasio-Cortez last year. Dromm’s campaign took in $1,325 from Koeppel since 2009, according to city campaign records. But Dromm said that no amount of cash will sway his efforts to make the street entirely car free as always planned. Safe street advocates are not willing to budge and are demanding the city move forward with creating the fully pedestrianized street they’ve been fighting for for years. Koeppel did not respond to a request for comment, but an employee at Koeppel Mazda said the car dealership recently met with the city about its plans for the street. The years-long effort to close a single, one-block street in Queens reveals a deeper problem with urban planning in the city’s most car-centric neighborhoods. The block of 78th Street that the city once hoped to close is just one of 44 similar blocks between the Brooklyn-Queens Expressway and the Grand Central Parkway — leaving 43 other blocks with unfettered access for car drivers. There have been 1,511 crashes since January, 2017 along that stretch, injuring 53 cyclists, 92 pedestrians and 275 motorists, killing five pedestrians. The deaths — and the 58-crashes-per-month average — earned Northern Boulevard the nickname “The New Boulevard of Death,” prompting calls for more enforcement of speeding and safety redesigns. One of those redesigns was supposed to be 78th Street. An earlier version of this story included a higher figure for donations received by Dromm. The council member told Streetsblog that he had returned one donation in the amount of $4,000 in 2016. They just refurbished this building from scratch. So, Koeppel built the entrance on 78th St already knowing about the park redesign. Poor little rich neighborhood, gains a tremendous amount of new park space and is whining over sharing a very tiny sliver on an end of the park that no one uses, except for maybe the gang members. Rich neighborhood? I guess you’re not a local. Obviously this commenter doesn’t know Jackson Heights at all or the people that use the space. Wow. They already leave cars parked outside along the curb on weekends taking up every space and double-park. Before on weekends you’d barely see a vehicle there. Now, filled. They redesigned the park and kicked out the Hispanic soccer players so the white people can use it. Thats the real story. But this fraud writer wont touch that one. No. They decided that an incredibly dense neighborhood dedicating large swaths of park space to just play a few sports wasn’t fair. When you have hundreds of people – and mostly kids of every race and ethnicity – jammed in one space and a fraction of that using an incredibly large space, well the choice is obvious. We need far more green space in Jackson Heights for everything – yes including soccer and other things – but until then we gotta be efficient with the little space that we have. And now thanks to cars there is the possibility of less than what was planned. You mean they knew the redesign would be modified to accommodate them. Life long resident actually. $1M+ Co-ops selling in the historic district that this expansion is adjacent to doesn’t necessarily scream low income to me. Many of those homes where these advocates live have their own private, interior gardens too. How much space do they need? Do you ever even go to Travers? There was a lot of volleyball and a little bit of cricket, but soccer? Nothing more than kids having a kickaround. Now they have a place to have a soccer kickaround in the multi-purpose play area that is fenced in. The volleyball players will have plenty of space at the Rory Staunton Field when the renovation is done this Summer. Beyond that, I see a lot more space for children to play, more seating with tables, and more space for all of the residents to enjoy themselves. I wonder what prompts people to fabricate racial grievances when they don’t exist. I think they wanted to create a fait accompli, so they would get the accommodation. Building gardens aren’t exactly park space or playground space and aren’t community spaces. Jackson Heights has relatively little park space for a neighborhood with over 100,000 people. In NYC terms, JH is not a rich neighborhood by any strech of the imagination. With that said, I don’t why people are up in arms about this stub of a street that will remain. The dealership has to continue conducting business, and the Garden School buses need to get in and out. The area that will be a street is adjacent to two buildings, not a park. And it gained a HUGE amount of space with the expansion of the park and acquisition of the field next to the Garden School. Maybe the advocates here need to accept a compromise over what is a small sliver of space in comparison to the larger gain. It would be nice to see them spend some of their time, effort and energy on other parts of the neighborhood where there is a real need. But then again, that may not enhance the bottom line of their own property values the way the Travers expansion will. Short of tearing down buildings somewhere there really isn’t any space in JH for more park space. Hence the concern that as much space as possible is available in Travers. There wasn’t space for more park space adjacent to Travers until they advocated for the closure of 78th Street and purchase of Staunton field. There are plenty of other streets in the neighborhood, where closures would not only serve to increase open space, but also foster greater safety for pedestrians. I would like to correct some of the misunderstandings contained in the article/comments. 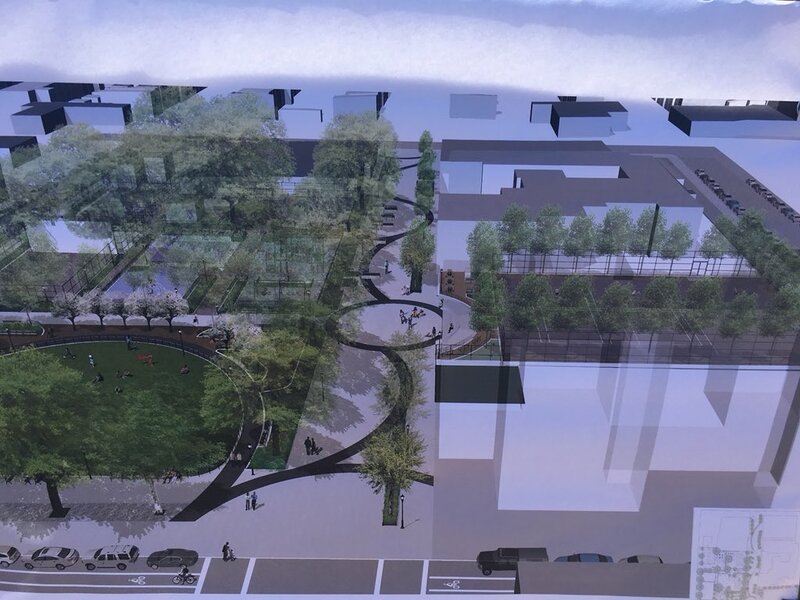 The effort to redevelop Travers Park was led by Councilmember Dromm, the Jackson Heights Beautification Group, The Green Alliance and community support. This effort got traction when Mayor Bloomberg assigned a Deputy Mayor Wolfson to oversee the process. As part of the negotiating, Garden School was permitted to drop off their students, park their buses and have access to their garages. The street was never de-mapped. A Toyota dealership leased the commercial property that Koeppel now leases. The entrance to the service area was not created by Koeppel; it pre-existed. There is a NO STANDING zone on the side of the street closest to the service area; this should be extended to include Saturday. Traffic enforcement is an absolute in keeping this 180′ dead end roadway safe for our children. The new park space is a wonderful addition. They rehabbed most of the building, but the entrance was already there. Yes, when they were redoing the building, they could have moved the service entrance, but they left it as is. The plan was to remove cars from a single block. Then a car dealership demanded some of the public space. Now city officials aren't talking. It's a dangerous, combustible situation. Streetfilms auteur Clarence Eckerson Jr. covered Saturday's rally and filed this film report.